IFP Energies nouvelles (IFPEN) is a major research and training player in the fields of energy, transportation, and the environment. From research to industry, technological innovation is central to all its activities, structured around three strategic priorities: sustainable mobility, new energies and responsible oil and gas. For more than 30 years, IFPEN has performed sandbox experiments designed to improve understanding of some of the processes governing tectonic deformation. 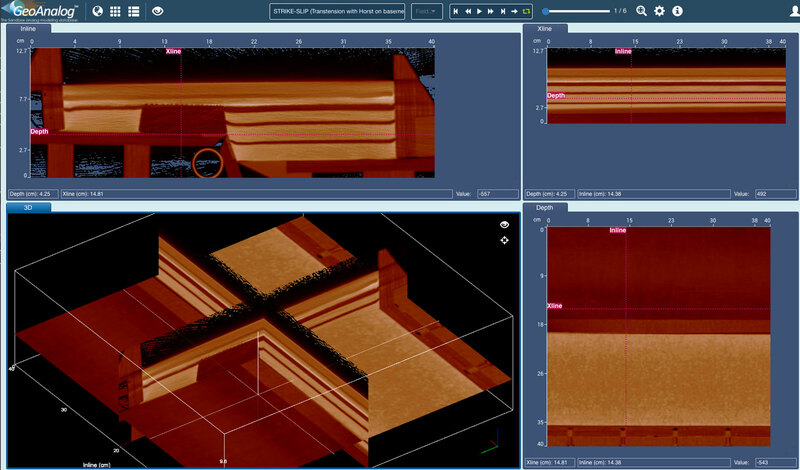 IFPEN creates analog models using a sandbox and a medical scanner—a powerful, non-destructive imaging technology—to observe internal structures of each model through the deformation at time scales. IFPEN then uses these analog models to produce 4D numerical models to simulate different types of rock deformation on a basin scale and to observe the kinematic evolution of a geological system. No integrated tool was available to easily access, visualize, and interact with a large, web-based database of sandbox experiments while interpreting complex structural areas. IFPEN contacted Interactive Network Technologies (INT) to implement this workflow using advanced HTML5 technologies. GeoToolkit.JS’s rapid, high-performance rendering of SEG-Y files makes this 4D view possible. Its dockable layout allows users to move slices into the 3D rendering, updating the 2D views to show the new slices. And GeoToolkit.JS hides null values to enable transparency in the 3D view and enhance the rendering. INT’s experience in developing industry-specific tools and advanced visualization software in an agile environment was key for the success of GeoAnalog. Using the Sails framework and Docker technology, development is efficient, rapid, and secure, with deployment taking less than 10 minutes. By focusing on a common goal, IFPEN and INT created a unique, valuable resource: a web application that uses a database of various analog models to develop new structural and tectonic concepts, validate structural interpretation, and reduce uncertainties related to the exploration of complex structural areas. See how GeoToolkit can help you achieve your objectives with a free 30-day trial.